The potency of fresh Bluebell combined with the sweeter fragrance of Hyacinth to create a very green and young Spring/Summer fragrance. 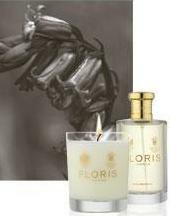 One of Floris's first home fragrance was Roman Hyacinth - which eptomised the fresh, floral notes of the Blue Hyacinth in the full bloom. Hyacinth & Bluebell takes its lead from this original fragrance and has proved to be one of our most popular to date.